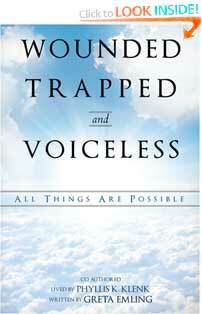 Wounded, Trapped, and Voiceless is the story of Phyllis K. Klenk, a special education school teacher who suffered a brain bleed that put her in a 3-year coma wherein she walked with God three times, heard what was said around her and awoke to the confines of a wheelchair, unable to care for herself, but with a measured, near genius, IQ and an urgency to share her inspiring story with the world. Greta was born in Saginaw, Michigan on September 7, 1954 to James and Marie Armbruster. She was the third of six children, three girls and three boys. Her father was a salesman, which caused numerous relocations during her growing years. These relocations presented many challenges and opportunities for change and adaptation. Her education through high school was varied between parochial and public schools due to the family relocations. She graduated from Port Huron Northern High School in 1972. She was a leader in her class and also enjoyed the creative arts of choir and drama in high school. She went on to St. Clair County Community College for one year and then transferred to Ferris State College where she obtained a degree in Allied Health. Greta practiced Dental Hygiene full-time in Saginaw until she married Peter Emling, of Erie, Pennsylvania in May of 1980.